You are here: Home / Uncategorized / Is Your Twitter Work Working? Is Your Twitter Work Working? Twitter can be a great platform for your business depending who your target audience is. Like any other marketing effort, you want to measure your results. 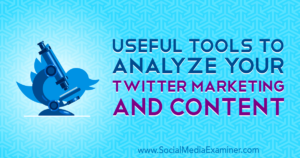 This article from Social Media Examiner gives you instructions and links to good tools. Share the post "Is Your Twitter Work Working?"